Built by Thomas Walker, solicitor, between 1840 and 1845, the design is developed from the usual square house with central hallway by addition of side wings; that to the north west accommodates the main staircase and additional rooms, one of the front rooms in the main block being opened to the entrance to make a spacious hall leading to the main staircase; the south east wing consists only of one first-floor room over a carriage entrance. 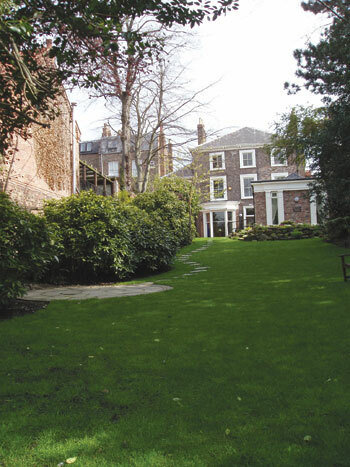 The house is of two storeys with walls of pale-coloured brick. On the street front the windows are emphasised by painted surrounds, those on the ground floor and the central window above having side pilasters with entablature above. The central porch has Greek Doric columns and forms a balcony to the window above with smaller balconies formed on the cornices of the flanking windows, all with cast-iron balustrades. Inside the entrance passage opens to the hall between Doric columns. The main staircase is beyond the hall; the secondary staircase opens off the entrance passage. Both the staircases have cast-iron balustrades with mahogany handrails. The principal room on the ground floor, at the back, has a richly decorated ceiling cornice and over the moulded architraves to the doors are overdoors decorated with urns and festoons in low relief by Wolstenholme. On the first floor a large saloon occupied the front of the house, originally with a fireplace at each end and two doorways symmetrically disposed. This room has since been divided into two separate rooms. One fireplace has been removed and the position of one doorway has been altered. Both the fireplace and overdoors are decorated with figure subjects and the enrichment is in composition by Wolstenholme. The ceiling cornice is decorated with flowers and leaves. 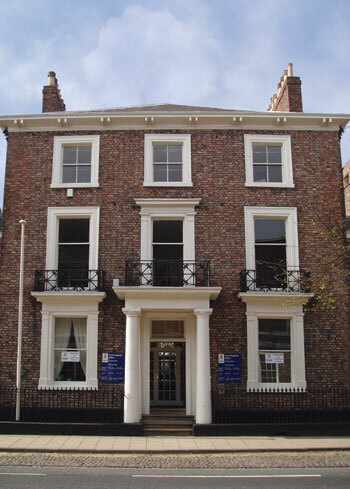 The property had serious structural defects when the Trust bought it in October 2003 and it required six months of renovation before it was ready to be leased back to the York Register Office. A new marriage room was built as an extension to the rear of the ground floor and was constructed as a modern non-denominational chapel-like building. It has a lantern roof and a stone floor with double French doors leading into the garden, which has been completely re-landscaped as a suitable back drop for wedding photographs.